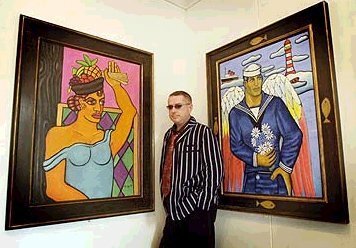 WAIST HIGH: Happy Birthday Holly Johnson. Born in 1960 in Liverpool, Holly first performed in 1977 as a soloist and as a member of the seminal New Wave combo Big In Japan, part of the Eric's club scene that spawned Echo and The Bunnymen, Teardrop Explodes, etc. Holly formed Frankie Goes To Hollywood in 1979. "Relax" reached number one in the U.K., Germany and other territories, and was banned by the BBC. "Two Tribes" (9 weeks at number 1), and "The Power of Love" both topped the U.K. charts, making British pop history. While "Two Tribes" was at number 1, "Relax" re-entered the charts and took the number two spot, which had not happened since John Lennon's death in 1980. Welcome To The Pleasuredome, F.G.T.H. 's number 1 debut album, sold 3 million copies. Their second album, Liverpool, was recorded in 1986, and "Rage Hard," the first single, went to number 4 in the U.K. Unhappy with the group's musical direction, Holly left the group in 1987. In 1989 he released his solo album Blast, which went to number 1 in the U.K. In 1993 he announced he was HIV positive. His autobgiography, "A Bone in my Flute," was published in 1994. Since the mid 1990's, Holly has made his living primarily as a painter (although he continues to make music). His works have been shown at the Tate Liverpool, and The Royal Academy.